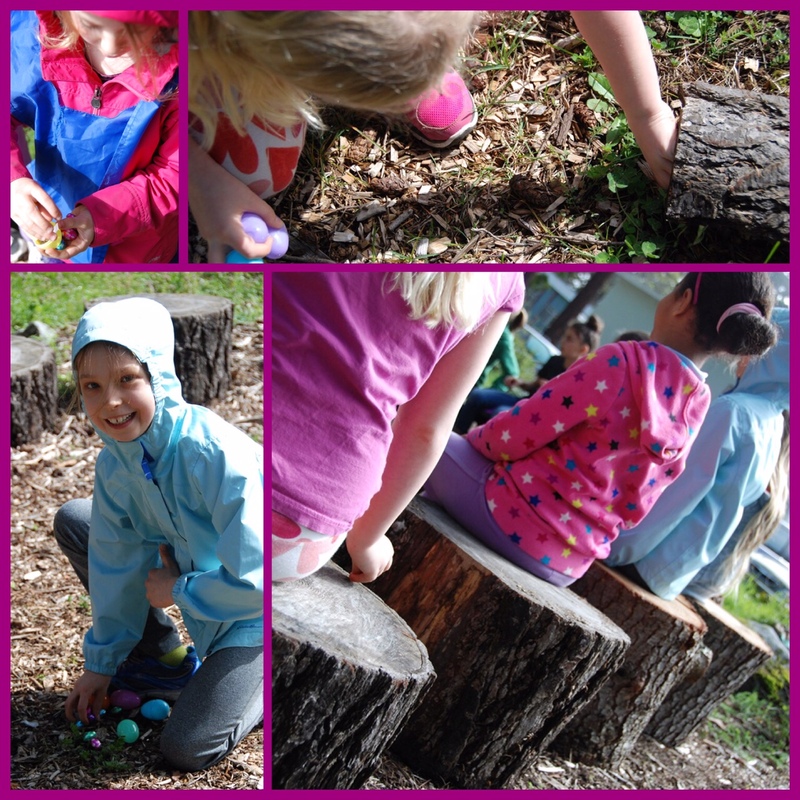 Garden Time takes place at the school during lunch recess. Children of ALL grades are free to drop in and do not need to pre-register for this program. However this year we have not had someone come forward to lead Garden Time and are actively looking for someone to step into this role. April 14th… Mount Doug Leadership Students to the Rescue! 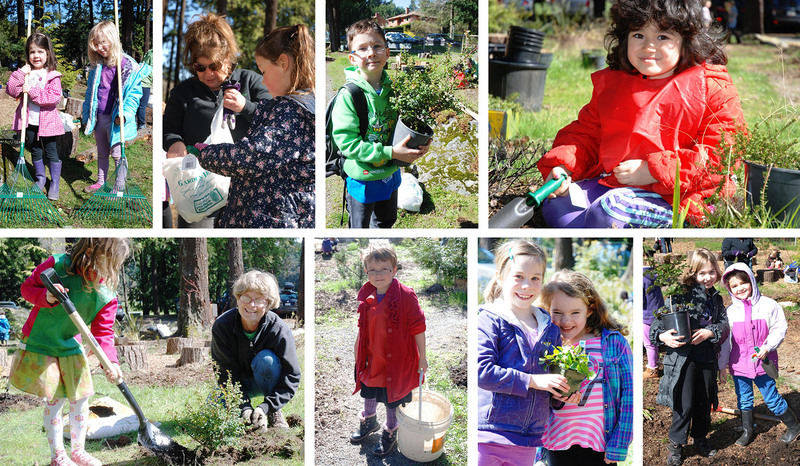 See the the below photos for a great initiative we had with Mount Doug Leadership Students who helped us clean up the garden and get it in tip top shape! We can get there again if we’re able to get this program going. A huge thank you to a hard working group of Mount Doug Leadership students (and a couple of dedicated families!) for coming out and giving us a hand in the garden in November 2017. It pretty much rained the whole weekend, apart from the two hours we were in the garden – what a result! Other happenings at the garden in 2017…. Creative talents were flowing at Garden Time in October – the birds are sure to be impressed! Thank you to the team of dedicated and hard working parent (and student!) volunteers who came to lay the new pathway at the garden on Sunday 17th September, 2017. There was a little light rain, but this did not dampen spirits at all. This year’s Garden Time students will be able to get around the garden without getting wet and soggy feet, and will have fun using the new pathway on Friday lunch-times. A special shout-out also to Capital Tree Service for donating the bark chippings for the new pathway….what a difference! Here’s the garden in August 2017….ready for new path and mulching…projects for this Fall. Learning time can be fun time too! 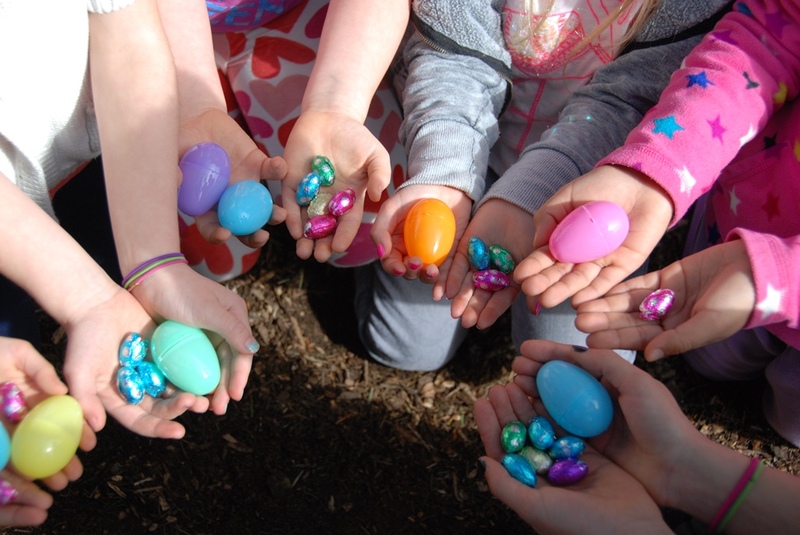 …and our Easter eggs were filled with…..seeds! 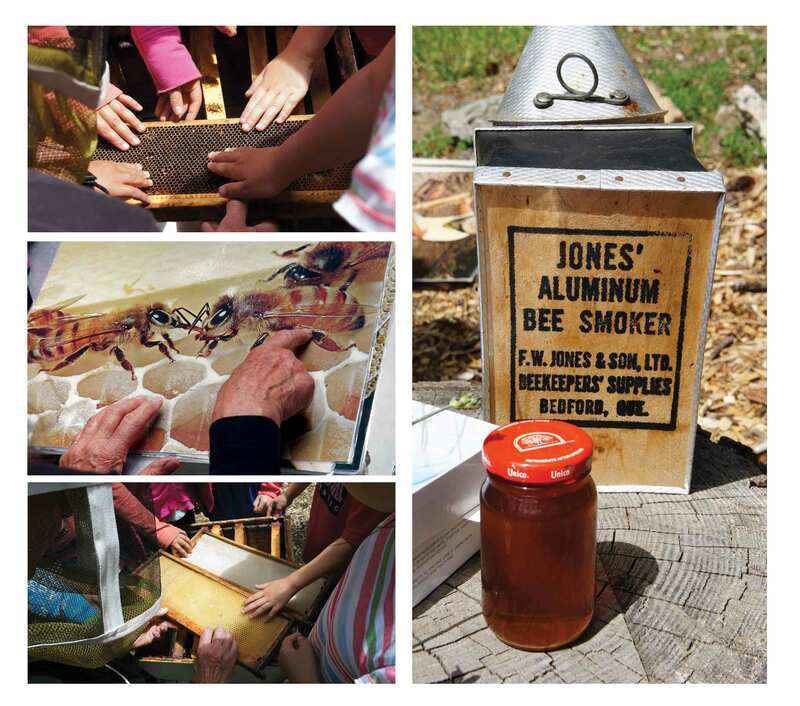 Nairn Hollott from The Capital Region Beekeepers Association came out in June to talk to the children about the importance of bees and how we can help these BUZZZY creatures in our own gardens. Thank you so much for this really interesting and interactive talk! In May, we were also lucky to have another ‘outside’ visitor as we were joined by Rob Hughes from the Saanich Municipality. 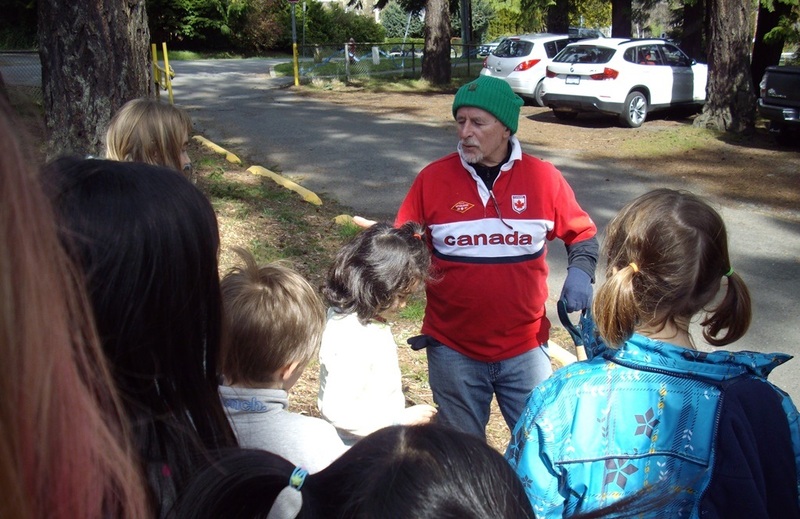 He spoke to the kids about the importance of trees in our environment and the student volunteers counted tree rings to find the age of trees. Rob talked about what uses trees have and what animals need trees to survive. 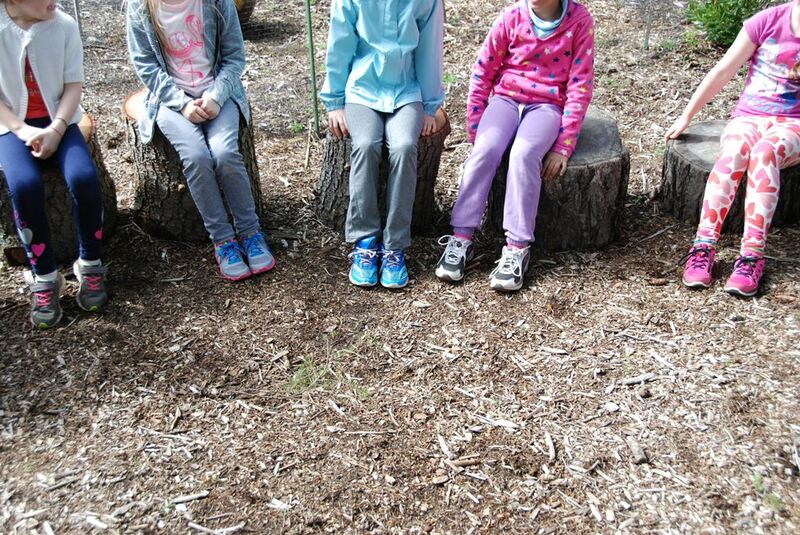 The children learned a lot about the natural life of trees. Thank you Rob for your time. 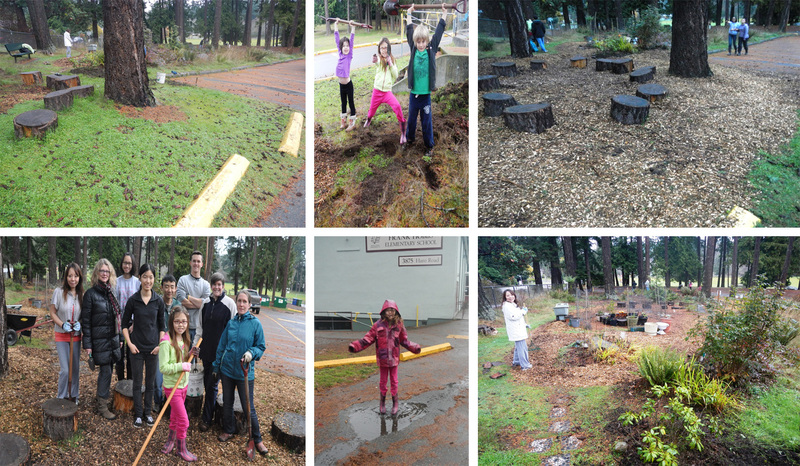 Thanks so much to a dedicated team of volunteers from the Mount Doug High School for braving the elements in May and helping to get the garden ship shape again in time for the summer. Sophia Zhai (Leadership Facilitator) was joined by Kevin Feng, Ben Zheng, Graeme Ko, Emma Sanders, Olivia Yelovatz, Sharon Edwards and Shua Cho. Parent volunteers Ayako Greig, Andrea Frost and Kellie Horler also braved the rain and came out to help. The team worked really hard for two hours and made a huge difference to the garden. A big pile of rocks was unloaded (kindly donated by another parent at the school) and this is now ready for the Frank Hobbs students to arrange and define pathway edges. The remainder of the mulch pile donated by Saanich was also laid. It was great to get all the ‘big’ jobs out of the way so that the students can have more educational visits and interactive Garden Time sessions over the next few weeks ahead. Thank you everyone! Thank you to Dave Friend from the Growing Young Farmers Society who visited in March to talk to the children about the importance of growing organic food in our gardens. We look forward to having Dave back to the garden in the future, working with him on developing companionship vegetable growing and expanding the educational potential we have here in own native garden. 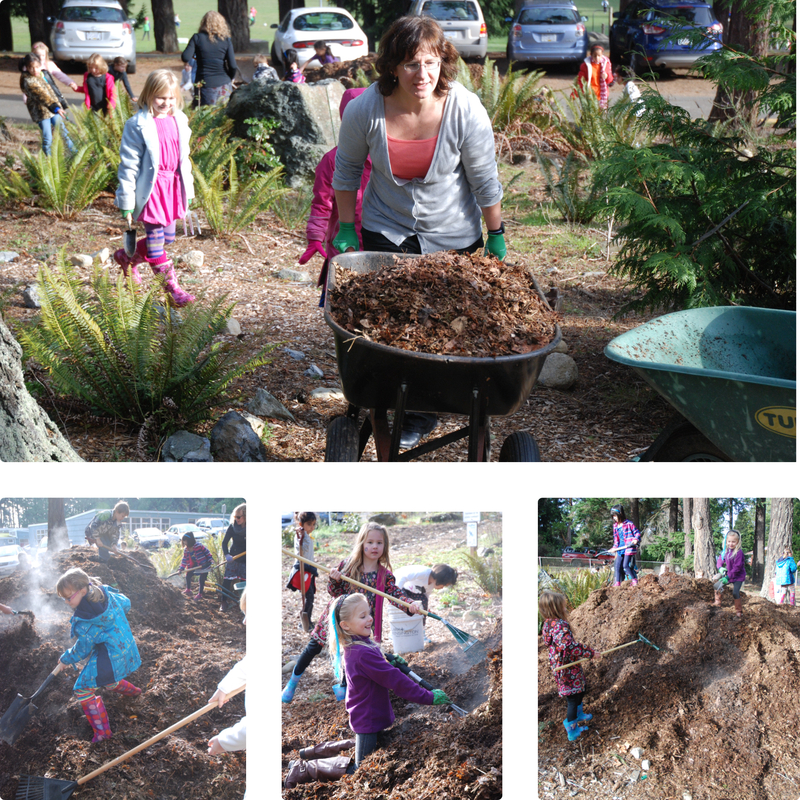 Thanks to the generosity of Oak Bay and Saanich municipalities, we have bark mulch for the pathways and also leaf mulch for the garden this year. A huge THANK YOU to Karla Viberg, Ayako Greig, Andrea Frost, Katrina Madsen and Karla Benson who worked at the garden on Saturday 30th November. Thanks also to a very hard working group of Mount Doug students (Sally Chen, Brian Chen, Julian Gripich, Kelsey Hoi and Cecilia Liu) and also to a few of our own enthusiatic Frank Hobbs students, we managed to distribute most of the bark mulch pile to the pathways and top end of the garden – it is a real transformation! Tara McHugh and Katrina Madsen and the garden club students were busy at the school garden on Monday lunch-times continuing to improve our native plant garden. The children weeded pathways and spread bark mulch. The pathways are looking really good! As the children work they are learning about gardening techniques and are gaining respect for the trees plants and insects in our garden. The mulching has also helped warm the ground and this fall we had a large variety of mushrooms popping up everywhere…..good food for deer and slugs, and also providing excellent nutrients for the garden. This summer a hummingbird nest was also found in the garden, proof of the variety of animals that are using the area. We now have a small fenced veggie patch (protected with fencing) and the children have had the opportunity to plant some winter hardy greens such as kale and also some flowers. The children cleared an area around the central rock and planted out snowberries at the end of October. We were lucky to have plenty of helpers to ‘rescue’ the worms from the weed pile – which gave a good opportunity to talk about these valuable residents. The Municipality of Saanich very kindly donated a Garry Oak tree to the native garden (made available through their boulevard tree planting program). Two very knowledgeable arborists came along to help the children establish the tree in it’s new home. We’ll look forward to seeing it grow over the years, and one day maybe have our own mini-Garry Oak meadow! 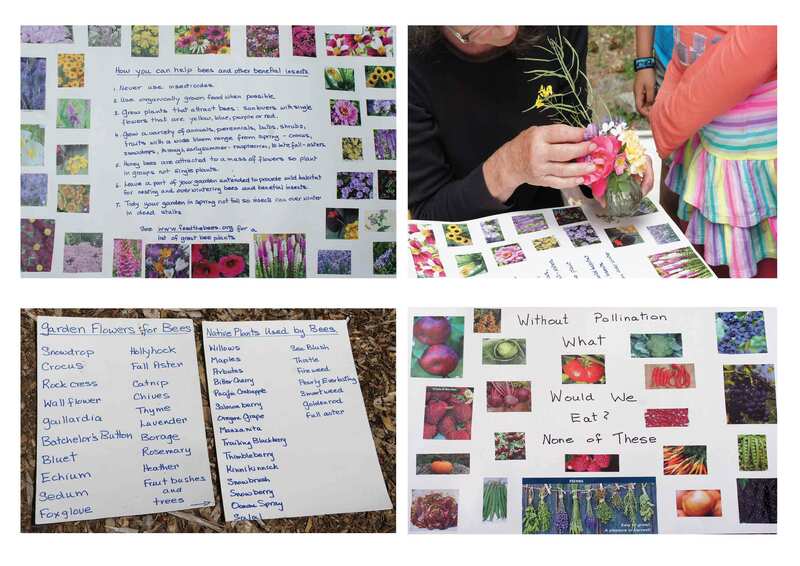 Thanks to the volunteers who came out to the school garden in June 2013. 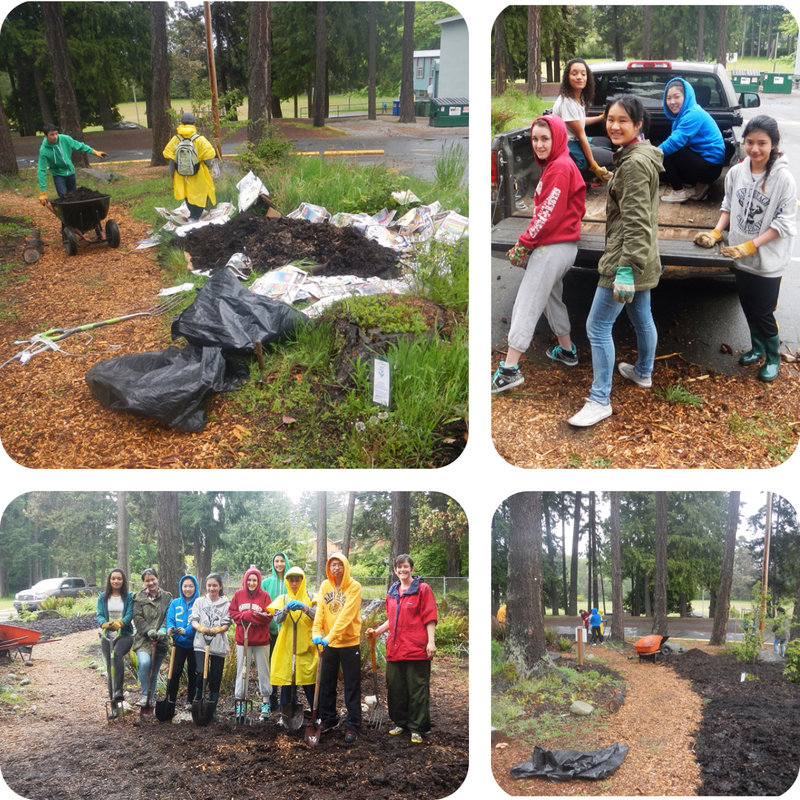 We were joined by an enthusiastic group of students from the Mount Doug High School who helped to achieve a mammoth group weeding effort. The garden is looking great and it’s much easier now to spot the native plants. The plants that were donated by Gardenworks in the Spring all seem to be doing really well and it’s great to see the garden growing so well. Thanks to everyone who has helped this year – it’s lovely to see the garden evolving – the children at this school year’s garden club are in for a treat! Just before the Spring Break, the children made bird feeders from wild bird seed and coconut halves. They had a lot of fun mixing the seeds with vegetable shortening – it was harder work than it looked!